Please take the time to read from our happy customers and their Hot Rod Hire Testimonials to our service at Hot Rod Heaven. We wanted to write a quick thank you for driving us on our wedding day last Sunday 30th December 2012. The cars are very cool and looked absolutely amazing on the day! We thoroughly enjoyed the whole experience! We will most differently be recommending you! Thanks for a brilliant service on 11th August 2012 on my wedding day. The cars & service was fantastic! Exceeded all my expectations. Would definately use your service again. Many thanks! We recently hired the black & gold dodge limo for the daughter’s wedding. A BIG HIT!!!! Just thought you might like to see a photo, not of the kids, ( why should they have all the fun! ), but of Gary & I next to the limo. My only regret was that I didn’t even get to sit in it!! Thanks again, may contact you again, the other daughter just got engaged. Thank you for driving us girls to the ceremony on the 3rd. David looked after us very well, making sure I didn’t slip and didn’t get too wet! Thanks for the umbrella! We had a great day and my Dad and I had a lot of fun on the way, sorry about his singing. This email is to thank you for your service for our wedding on Thursday 29 December 2011. We were so happy with the car on the day and my husband and I could not have asked for better service from you. Just wanted to say a huge thank you for your wonderful service on our wedding day! The car looked amazing and the service was fantastic!! Here are some photo’s for you to enjoy! Just wanted to send out a huge thank you for getting us to Elmswood Estate on time and driving us around after the ceremony for our photos. We had a great time in the car, and David, you were fantastic! The photos have come up so well with the car too! Just getting back to some routine after a long honeymoon and I wanted to say a big thank you for the cars and drivers on our wedding day. They were fantastic and the cars looked amazing. Dave and I are both so very happy and were both extremely happy on the day. I thought I would send you a photo or two of the cars. I’m sure you have a million, but never mind. It has taken me a few weeks, but my husband and I just wanted to say a big “Thankyou” to you both. We really appreciated the service you gave us at short notice. 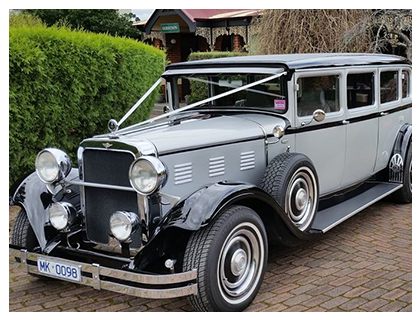 The Limosine was absolutely gorgeous and certainly filled the needs of the Bride and Groom in ways you couldn’t begin to imagine. Tony was an absolute Gentleman, totally abliging. We wish you continuing success with your business. We just thought we would send you guys a photo of us & the beautiful cars. Thank you so much for driving us on our day, we were so happy with the cars & the fellas who drove us were great too!! We would highly recommend you to everyone we know! We can send a better pic through when we get our professional photos if you want just let us know? Just wanted to send a quick message to say how much we appreciated all the effort that was put into our wedding!! Dave and the other driver ( i apologise for not remembering his name!!) were above and beyond helpful!! In fact they helped make us relax during part of our photo time by making jokes and and making us laugh which really helped us a lot!! All of our guests raved about how funny the men were!! But more importantly everyone LOVED the cars….but we knew they would!! recommending you to all of our loved ones!! Thanks so much for the photo of the boys and their shoes! It’s a brilliant shot! It’s a shame I couldn’t go in the car with the boys for that photo… As I had matching shoes in orange!!! We had such a great day and the cars were just stunning. I wish we could have spent more time in them! The service was great with both drivers and I haven’t seen all of the professional photos yet but from what I have seen, there are some great ones with the cars. I will pass some on to you when we get them back. Thanks again, and hope your business continues to strive. I just wanted to say thank you very much for providing a beautifully kept car and for making me feel at ease with a great customer service based experience. Our diver was soo lovely I couldn’t have asked for any better! 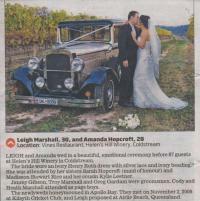 We would like to thank you both for that amazing car and help you provided for our wedding day. It was just what we needed, perfect timing, perfect picture for a perfect place! Chris was absolutely helpful and very comforting to have around. Please find the attached photos as proofs of a perfect day. Just wanted to say thanks again for the fantastic service on our wedding day! I have attached a couple of photos with the cars in them for you. 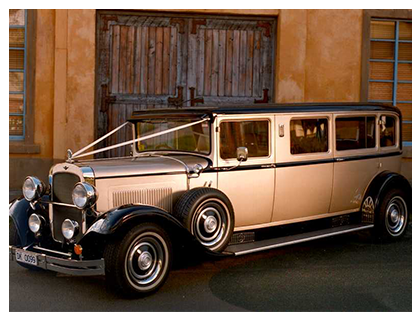 I would like to just thank you for the beautiful hot rod limo… it was beautiful and got lots of compliments! A big thanks to Tony the driver, he was fantastic and very accommodating and made my day easier. I will highly recommend you to other potential brides. Once again, thank you for your services. We have been meaning to send you a Thank-you email for your fantastic service and use of your cars on February 20th, 2010 for our wedding. Obviously things have been very busy but we have finally got around to it. Thank you so much for your no fuss service, comfortable cars and your air conditioning (which was Jenny’s worst fear, air conditioners that didn’t work!). Our drivers were willing to accommodate our requests and weren’t even fussed about parking on the side of the road while we got photo’s, they even offered to drive into the paddock! The cars were immaculate which got alot of remarks from our guests, and our drivers were also helpful in advising the photographer on better photographic angles… particularly of the cars. All in all, it was nice to have people around that weren’t stressed and willing to help when required. Again, Thank-you for a reliable and genuine service. We have attached some photo’s from the day for you to have a look at. 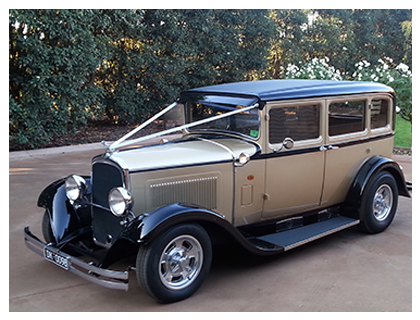 We would just like to thank you very much for the use of your beautiful car on our wedding day. 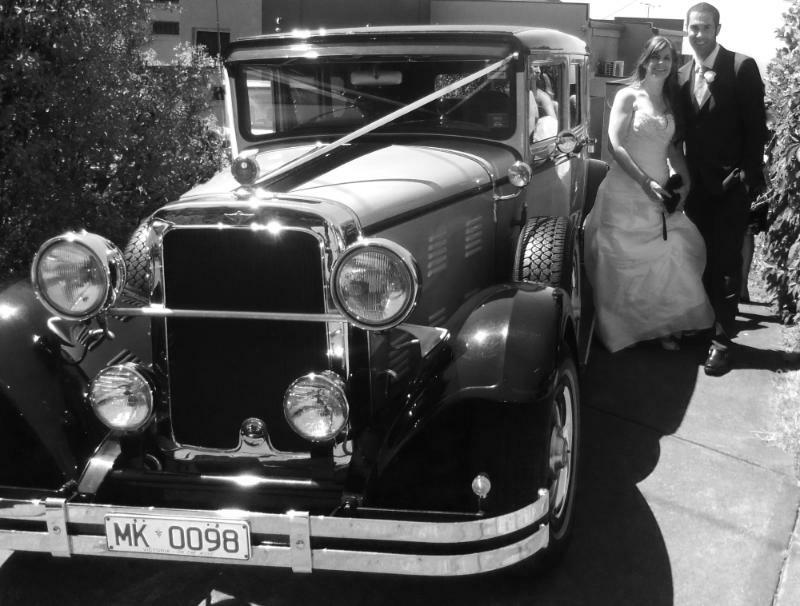 The black and silver stretch was absolutely fabulous to drive everyone to the ceremony and the photo with your car afterwards is our favourite. Please find attached some fabulous photos which I hope you will enjoy. Sorry its taken so long to send this email. Me and Rhonda just wanted to say thank you so much for your help on the day. The cars looks great and the drivers where very helpful. 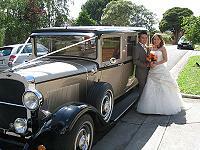 We had the Silver limo and the ford hot rod which came out great in our photos and where perfect on the day. The ride home in the Gold Limo was also very impressive. I wanted to send you guys an email to thank you for driving us around in the gold hot rod on our wedding day. We all loved the car and David was a fantastic driver! We just got our proof photos and the car had come up great. Once again thank you for the cool car! We hope this email finds you both well. We would like to say a huge thank you to you both for all of your help not only on our wedding day but also leading up to it. You were a pleasure to work with and your hot rods were a hit with our family and friends. They also complemented our photos perfectly. We would also like to thank you for your all of your assistance during our photos ie: helping the bridesmaids hold bouquets, holding umbrellas and shawls etc etc – very much appreciated! All the best for the wedding season! Just a short note to say THANK-YOU. We had an amazing day and to top it off an amazing car to match the whole theme. There were many vintage car lovers there and really commended the maintaince on the amazing limo. Thank god we had airconditioning cause it was a warm day. Everything went really well, would have loved to be in the car longer but was so nice to be driven around in luxury for the afternoon anyway. Thank you once again for such a gorgeous addition to the day. Will highly recommend you in the future… maybe our anniversary? Who knows!!!! Thank you ever so much for a lovely day, 24th of Feb. everyone loved the car and my husband was very impressed. I remember you asking the photographer for some of the pics with the car in it. Just wondering can I help you with that? Anyway many many thanks!!! Top Job. Thank you so much for your services for our wedding, it was a wonderful day and it couldn’t have been what it was without you. Everybody loved the car and David your friendliness made the whole thing a much more pleasant experience. Thank you for sticking around please let us know how much we owe you so that we can fix you up. Thank you for your professional and courteous help. We look forward to seeing your car (and driver!) again on the day…We were very impressed! Just a note to thank you for being such good people to deal with and for having the car looking so lovely for Sarah and Josh to attend their Deb ball. It was certainly a highlight for Josh and Sarah thought the photographs with the car were great. 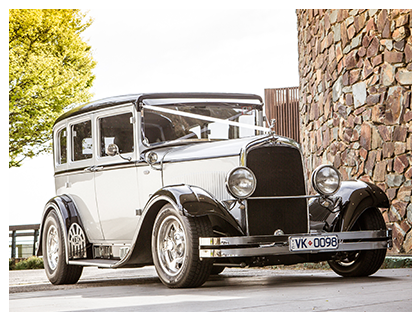 We are just writing to THANKYOU so much for our Beautiful cars you provided us with on our wedding day the 8th of March 2003 at Ballara Receptions in Eltham. The cars were all Fantastic and the service by the chaffuers was outstanding. You not only put us all at ease on the day but also made our day unforgettable (the photos are unreal). All our guests commented on the cars saying how fantastic they were and are still talking about them even today. I wish you all the best of luck in the future and have no hesitation in recommending you to anyone. Just writing to thank you for making our wedding day so fantastic. Jayson and I both had a wonderful day and all our wedding guests had a great time as well. The cars looked fantastic, and were a talking point with a lot of our guests. The photos with the cars turned out really well also. We were all extremely happy with the service that we received all thoroughout the wedding day, and had heaps of fun riding in both the Fords. Our wedding party had fun with the drivers, who were very friendly and put us at ease on our way to church. Once again, thank you for a memorable occasion. What fabulous cars! We all absolutely loved them. Thank you for being such a great part of our day. Just wanted to say a great big thank you to everyone involved with our wedding car hire. The cars looked absolutely fantastic on the day (and the photos turned out great too). Also an extra big thanks to our drivers whose hilarious sense of humour made our day loads of fun. We will highly recommend you to anyone. A big thanks for getting Brad and groomsmen to the gardens on time and not fully intoxicated. The boys fully enjoyed the noise, attention and conversation. Thankyou for the great service you provided on our wedding day. You helped put my mind at ease and tried to keep the nerves away with your sense of humour. Your service was a great start to a perfect day. Two beautiful cars, everyone raved about them. Thanks for your help, very professional but friendly with it. You’ll do really well. Thanks heaps, All the best. Thank you so much for the warm friendly service and beautiful cars you provided us with for our wedding. It was such a hot day, and still we were so comfortable in your cars! Also David, Adam would especially like to thank you for stopping so he could take home our wedding sign.